I remember when Ryan started kindergarten and my biggest hope for the school year was that Ryan would learn to get from the bus to his classroom without getting lost wandering around the school first. I had basic hopes, like he would be o.k. about using the school bathrooms, since it didn’t have the loud automatic flushing toilets and hand blowers. I hoped that he’d take his hands off his ears long enough to get his name on his paper, that he would at least eat part of his lunch, and that he’d survive the first fire drill. I hope that this year he finally gets it. I hope he gets why it’s important to do his school work and why an A is better than an F. Ryan doesn’t have that social understanding of school yet. While most typically developing children want to please their teachers, want to appear “smart,” and want to get A’s, many kids on the spectrum don’t care what others think or how they appear to others. They just know that a teacher is making them do work, and unless it’s extremely interesting to them, they don’t get why they have to do it. “Getting it” is a process, and for Ryan includes lots of rewards along the way. My hope is that third grade brings Ryan just a little bit closer to understanding what school is all about. I hope that Ryan learns to be more independent in the classroom. For Ryan, independence is that door between the special education and general education classroom. Ryan might need to have his work modified. He might need special supports like check lists, schedules, and visuals. But unless he can manage his learning in a classroom of 22 other third graders, he will forever be spending time in a special education classroom. That’s not bad, but my hope for Ryan is to slowly work his way into the general education setting and one day find himself spending the majority of the day with his peers. I hope that Ryan will make some friends this year. Ryan is a likable guy. He’s funny and loves to laugh and be silly. He also likes to watch the other kids on the playground from a distance. If they are playing with a ball, he watches closely. When they finally put the ball down and run away, Ryan picks up the ball and starts imitating what they were doing. That’s Ryan’s comfort zone. He’s interested in the other kids, but only from a distance. This year, I hope that he will get the courage to join them at ball, and not wait for them to put the ball down and run away. I hope that Ryan will continue to love school. Ryan has always loved school, from his very first day of preschool. I know this is something to be thankful for and something that could change very fast. I haven’t always loved Ryan’s school. My husband and I have struggled at I.E.P. meetings. We have not always seen eye to eye with the director of special education of the school district. We will continue to have to advocate for our son and work to get him what we think is necessary for his success. But somehow, all of this has always gone over Ryan’s head. He has remained happy, and I think it all has to do with his caring teachers and their ultimate support of Ryan and his needs. My final hope for Ryan’s third grade year is that his new teacher will “get” Ryan, who he is, and what he needs. Special needs children are complex, especially children with autism who can greatly vary in their strengths and challenges. I hope Ryan’s teacher will be able to see his potential and his intelligence. I hope she will be able to enjoy his personality. I hope she will let him explore and assert his independence, but I also hope she will be strong enough to teach him limits. Just as children with autism vary greatly along the spectrum, I know that all parents have hopes for their child’s school year that will vary greatly. May all your hopes for this year come true and may this be the best school year for your child yet! Categories: Milestones, School, Uncategorized | Tags: anxiety sensory integration disorder school, autism, autism acceptance, autism awareness, children with autism and school, inclusion, sensory integration disorder, special needs | Permalink. Ryan’s second grade year is officially over. I wish I could say it was a good year. I wish there was a teacher I was sad to say goodbye to, or that Ryan thrived and grew in more ways than I could imagine. Instead it was a disappointing and stressful year. But it was also eye-opening. This year, I came to the conclusion that somewhere along the line most parents of special needs children are going to realize that their child’s school doesn’t always have their best interests at heart. This might happen right at the beginning of the child’s school career or later on. For us, it was later on. Up until this year, I didn’t have much trouble getting Ryan’s needs met. I smugly counted my blessings. How did he get so lucky to have the wonderful teachers and programs that were available to him? Ryan was in a K-2 self-contained classroom, which meant his major subjects, math and reading, were taught in a small group setting. Ryan spent the rest of the day (social studies/science, related arts, lunch, recess) with his peers. This seemed to work well, especially since Ryan had sensory issues and often needed breaks from a large noisy classroom. The problems came when Ryan’s needs changed. Suddenly, Ryan could handle the general education classroom and was actually learning along with his peers. He still needed support in the general education classroom with following directions and with his focus, but he was successful. Ryan’s reading ability sky rocked. He started reading on a fifth grade level. He could read almost anything. But the teachers weren’t so enthusiastic about what Ryan could do. The teachers reminded me that the comprehension part of his reading was at the second grade level. Even so, a child reading above grade level and comprehending at grade level probably needed more challenges. They also made the case that third grade was going to be an extremely challenging year. Just because he could succeed in second grade didn’t mean that he would succeed in third grade. Ryan also started to get the hang of taking tests. He was studying for science/social studies tests at home. He was taking the tests and passing, and even got some A’s and B’s. It also became apparent that Ryan continued to lag behind on social skills and needed more interaction with his typical peers. He had no friends. When children tried to interact with Ryan, he ignored them until they went away. In conclusion, it seemed that Ryan was ready for more general education time. He needed to spend more time with his peers for social and academic reasons. But was the school ready to give Ryan more general education time? The answer was no, basically because Ryan needed assistance in the general education classroom with following directions and staying on task. His special education teacher even said to me, “Ryan is not going to get one of my assistants in the general education classroom. Those assistants need to stay in special ed.” This teacher was not willing to let one of her assistants help Ryan in general education setting, even if it was in Ryan’s best interest. We just assumed that Ryan would get more and more general education time as the years went on. We assumed that he’d get help from an assistant who would slowly step back as Ryan became more independent. We wanted to believe that the school district was progressive in their thinking about special education, and not stuck in the 1950’s. After all, children need to be educated in the least restrictive environment or they are breaking the law. The problem is, IDEA is worded vaguely so that a school district can interpret the meaning of the least restrictive environment to match their own outdated philosophy. Isn’t it just natural for parents to want their children to be educated with their peers? Why should special needs children miss out on doing what the other kids are doing? Why should they be put in a room down the hall away from everyone else? It’s easier to have 4 or 5 students to an assistant than 1 student to an assistant. It’s also more cost efficient. But nobody wants to admit that a lot of decisions are based on money. Children with special needs are so varied in the way they learn. Every child is different and needs different things in order to succeed. One size does not fit all. A program that works for one child will not work for another child. Schools need to work with parents, who usually know their child best. Instead of rolling their eyes (And believe me, I experienced this unprofessional behavior at an I.E.P. meeting! ), the schools should be listening carefully. Unfortunately, most school districts have separate special education and general education departments. They are even funded separately. Although the principal participates in I.E.P. meetings, he usually doesn’t have much interest or say in what goes on with the special education students beyond being a friendly and inviting administrator. After all, special needs students are often exempted from the yearly school wide testing. Their scores aren’t part of the scores that are published each year. If your child is in a school district whose identity is based on their superior test scores, your child’s education isn’t really a priority if they aren’t going to help elevate the scores. In fact, some schools might actually believe that your child could harm the scores. My personal theory is that schools fear having special education students in the general education classrooms because they could distract the teacher and other students from their main mission: teaching to the test. No one should be in the classroom that could cause the teacher or students to direct any of their energy elsewhere. And what grade does testing begin to be extremely important? Third grade! The grade that Ryan isn’t supposed to succeed in because of how difficult it’s supposed to get. Despite the fact that Ryan got an A one semester in second grade general education social studies (the subject matter or tests were not changed, Ryan just had an assistant with him), the school wanted to put Ryan in special education social studies and science in third grade. So we called an I.E.P. meeting and got an advocate to come with us. We got Ryan his social studies and science classes in the general education class next year, but we really had to push for it. The meeting was horrifying in many ways. I know now that getting Ryan time in general education is going to continue to be a fight.We will continue to call more I.E.P. meetings and work with more advocates. Every year will be a push for what we believe will be best for our son. I never thought I’d have to fight for anything. Being a former elementary school teacher, I never thought I’d have to be THAT kind of parent. In fact, I was determined not to be THAT kind of parent. But children with special needs come into this world already facing obstacles and challenges that most typically developing children never have to face. These children shouldn’t also have to face obstacles to their learning. Categories: Education, School | Tags: aspergers, autism, autism acceptance, autism awareness, IDEA, included, inclusion, least restrictive environmnet, mainstreaming, special needs | Permalink. 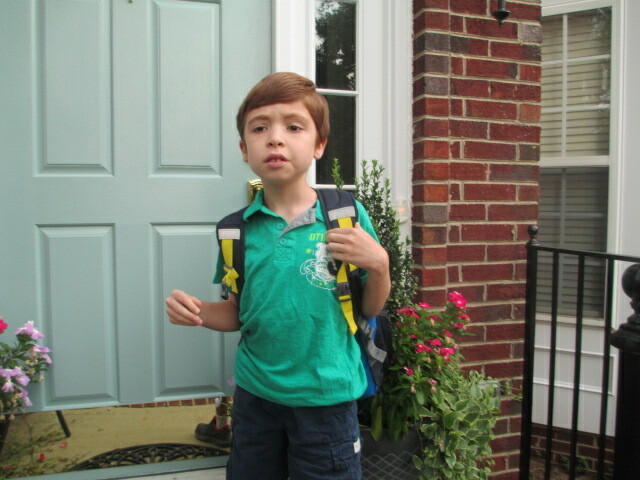 Ryan got on the bus this morning and started his first day of second grade. He woke up by himself and came downstairs dressed and ready to go. When was the last time that happened? I have a little boy who loves school, which says so much about the teachers who work with him. We have been blessed with an exceptional teacher who really understands and knows Ryan. This will be the third year he has been in her K-2 class. She teaches Ryan all of the academics, but he joins a typical second grade class for morning circle, social studies, science, lunch, recess, and related arts. He has a one on three (there are three second graders) aide to help him when he is in the typical classroom. For the most part, Ryan has thrived in this type of setting. Deciding how to educate a child with autism can be difficult. Many children on the high functioning end of the autism spectrum are also very bright. They can handle the academics. At the same time, they struggle socially. And school is all about being social. Put a child who is delayed socially into a typical class and academics can suffer, unless he gets the proper support. In the typical classroom, Ryan also has to deal with sensory overload. Bells ring, loud announcements are made, fluorescent lights are bright, and 23 other kids in the same room can feel crowded. Ryan has trouble following teacher directions because he can’t filter out the extra noise like chairs scraping across the floor, sounds in the hall, loud voices, cars going by outside of the windows. Also, being social has no meaning for Ryan. He doesn’t automatically greet a person because he doesn’t care whether or not the person thinks he is rude. He doesn’t understand the concept of winning because he doesn’t understand why he would want to do better than someone else. He also don’t get why he has to do a good job with his school work, since he don’t understand the social concept of not wanting to appear less smart than his peers and looking like he doesn’t understand. Basically, Ryan doesn’t feel the same social embarrassment that his peers feel. I thought a lot this past summer about how to best educate Ryan. I’ve been reading about inclusion and what the experts say is best for a child with autism. I’m beginning to think that no expert is as much of an expert on my child as I am. I’m going to have to figure this all out by myself. There are experts who think that autistic children, no matter where they are on the spectrum, should be totally mainstreamed no matter what. I don’t agree. There are too many factors to consider. However, I had a conference with Ryan’s teacher last week about starting to include him in a typical math class with his peers. Ryan is more advanced in math than his other two second grade buddies in the special education class, so Ryan gets his math instruction by himself. I feel that if Ryan is going to learn more social skills, he shouldn’t spend too much time by himself. Math is also just one hour out of the day, so it’s a good place to start. It’s going to be a balancing act. Ryan will need to deal with the social aspects of the classroom while still being able to learn the academics. It’s something we will need to figure out as we go along. The teachers and I will need to communicate and work together everyday to creatively find ways to help Ryan deal with the obstacles that may come up. That’s what education is all about. Categories: School | Tags: anxiety sensory integration disorder school, aspergers, autism, autism acceptance, autism awareness, first day of school, inclusion, inclusion mainstreaming | Permalink.